Birch Copse aims to provide a safe, respectful and supportive learning environment that enables learners to feel valued and reach their potential within a happy, healthy and caring community. All children are encouraged to enjoy learning and experience a creative and stimulating curriculum to help them become confident and independent learners. We aim to create an environment where all achievements and talents are recognised, including high social standards and personal and academic achievements. 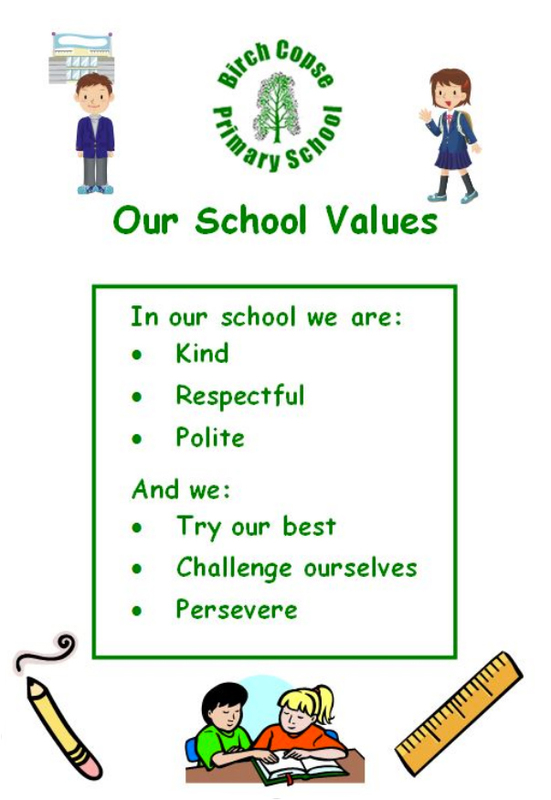 Our School Values were created through consultation with children, parents, governors and staff. The values are shared with the children and used for our reward system throughout the school. Maintain the school’s high achievement rates in national assessments, including outcomes for disadvantaged pupils and G&T. (EYFS, phonic screening check, KS1 & KS2 SATs). 1. To improve the effectiveness of the teaching of spellings. 2. To ensure differentiation in Foundation subjects meets the school's expectations throughout the school.3. To further improve the consistency of teaching scientific enquiry and embed a robust science assessment system. To improve the effectiveness of Subject Leadership in foundation subjects. To continue to develop the children’s high standard of behaviour for learning by embedding current practices and introducing some growth mindset strategies. To increase the percentage of children achieving expected ELG for Number to be in line with the other Early Learning Goals. The target is for 90% of children to achieve Expected or higher with 25% achieving exceeding.